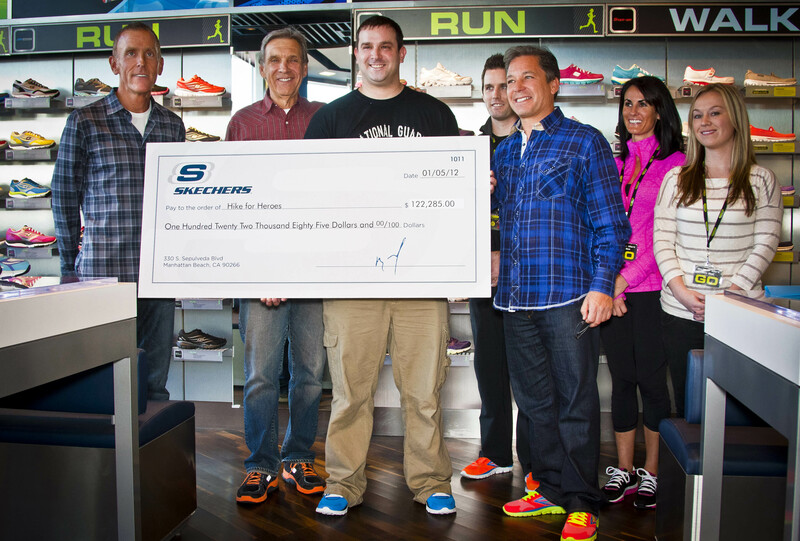 The SKECHERS Foundation presents a check for $122,285 to Troy Yocum for the Active Heroes charity foundation at the company’s flagship store in Manhattan Beach, California. 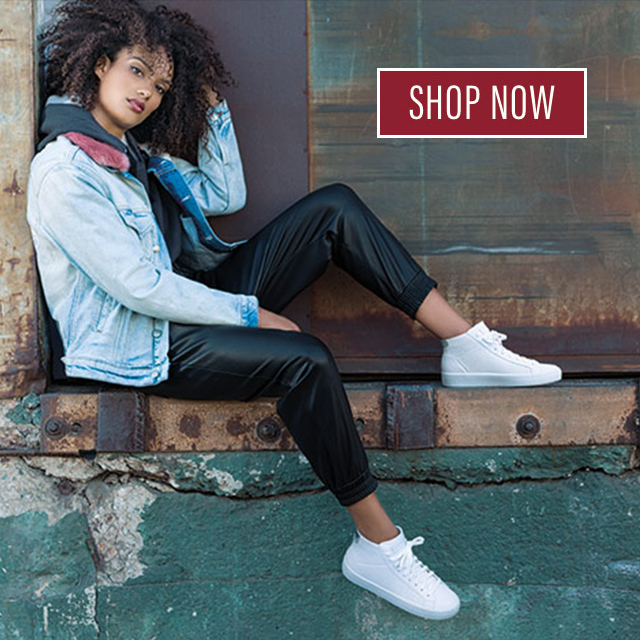 SKECHERS USA, Inc. today announced that it raised more than $120,000 for military families through its nationwide network of SKECHERS retail stores. The 2011 fundraising drive was in support of Iraq War veteran Troy Yocum’s Hike for Heroes campaign, which raised awareness and funds for military families in need as the former soldier walked across America. The SKECHERS Foundation will make this fundraising achievement by presenting a $122,285 check to Yocum for the Active Heroes charity foundation at the footwear company’s flagship retail store in Manhattan Beach, Calif., on Thursday, January 5. Since the Hike for Heroes campaign began in April 2010, Troy has raised more than one million dollars for the Active Heroes foundation. His journey will continue as long as U.S. military families require assistance. Troy and Mareike plan to hike another 1,500 miles in 2012 through National Forests and at special events from coast to coast, with the ultimate goal of raising $5 million to directly benefit military families in need. Meb Keflezighi and SKECHERS GOrun Continue on to London! Congratulations to Meb Keflezighi who crossed the finish line first at the 2012 Trials in Houston, Texas, and will represent the United States this summer at the 2012 Games in London. 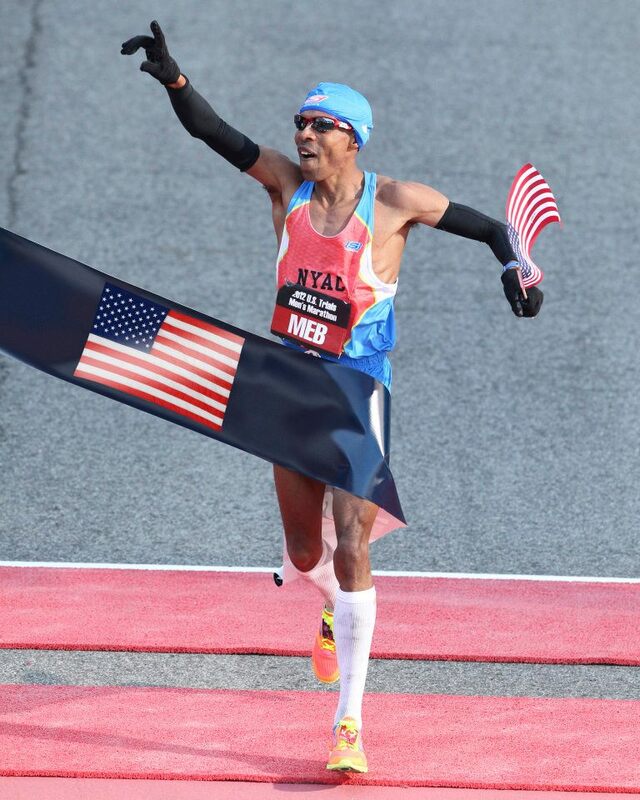 Meb not only finished first at the trials, but he also set a new personal record of 2:09:08 – his second PR in 69 days – while wearing his SKECHERS GOrun sneakers. This will mark Meb’s third appearance at the games, and his first competing in SKECHERS GOrun sneakers. He ran the 10,000 meters in Sydney, and at the 2004 Games in Athens, Meb finished second in the men’s marathon event to earn a silver medal. At the time, he was the first American male to take home a marathon medal in 28 years. Check back to receive updates and follow Meb on his journey. Want shoes like Meb’s? Visit skechers.com to get your pair or learn more about SKECHERS GOrun performance footwear. Meb Keflezighi and SKECHERS GOrun Head to Houston for the U.S. Olympic Marathon Trials! Meb Keflezighi will compete at the U.S. Olympic Marathon Trials on Saturday, January 14 in his SKECHERS GOrun sneakers. After an impressive finish as the fastest American and a new personal record at the 2011 ING New York City Marathon last November, Meb Keflezighi is on the move again, this time heading to Houston, Texas for the U.S. Olympic Marathon Trials. On Saturday, January 14, Keflezighi will race in his SKECHERS GOrun shoes for a chance to compete against the world’s best runners at the 2012 Summer Olympics in London. If Meb qualifies, it will mark his second appearance at the Olympic games, and his first competing in SKECHERS GOrun sneakers. In 2004, Meb finished second in the men’s marathon event winning the silver medal at the Summer Olympics in Athens. 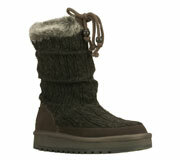 Stay Warm this Winter in SKECHERS Boots! The holiday season may be over, but for some people the winter weather isn’t going anywhere for a while. But no need to worry! Stay warm and cozy this year as you ride out winter’s icy wrath in the latest styles of SKECHERS boots for men and women. All of the comfort of your favorite warm cozy sweater goes into the stylish SKECHERS Keepsakes – Blur boot. The cable-knit sweater upper with a soft, snuggly faux fur collar and lining give a great casual look and lots of warmth for chilly days. Go crazy for the cool, tough style of the SKECHERS Lunacy boot. Soft all-suede upper in a slip-on, engineer-styled casual boot with metal buckle detail. A cool, classic look that goes great with jeans, skirts or leggings. 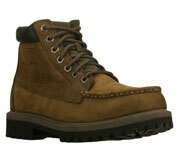 Cool, classic style and reliability comes in the SKECHERS Sergeants – Rugen boot. Waterproof nubuck leather upper on a mock toe chukka style casual lace-up boot with reinforced stitching, comfortable sole and padded collar. Tough style meets comfort. Life is your highway in the SKECHERS Cinder – Twist boot. 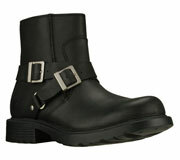 Smooth durable leather in an ankle-height, zip-side motorcycle style boot with dual strap and metal buckle accents. Instant cool with a lot of built-in comfort. Experience Natural Flex Movement with SKECHERS GOwalk! Introducing a new way to GO with SKECHERS Fitness. The perfect athletic cool-down footwear, SKECHERS GOwalk is an easy slip-on that weighs nearly nothing, yet gives you ultimate comfort with a natural, barefoot feel just like the SKECHERS GOrun shoe. SKECHERS GOwalk allows you to interact with and respond to practically any surface, while offering the additional benefit of real-world protection. The GOimpulse sensors on the sole are placed to offer ideal support and comfort. And the shoe flexes and twists to help you walk naturally. They’re perfect for post-workout cool-downs, fitness walking and everyday casual wear. 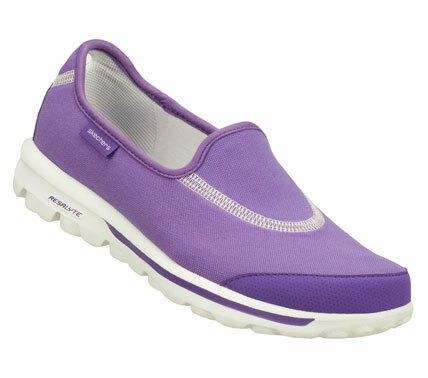 SKECHERS GOwalk is available in several colors, with even more coming soon. Try on a pair of SKECHERS GOwalk and you will feel the difference!